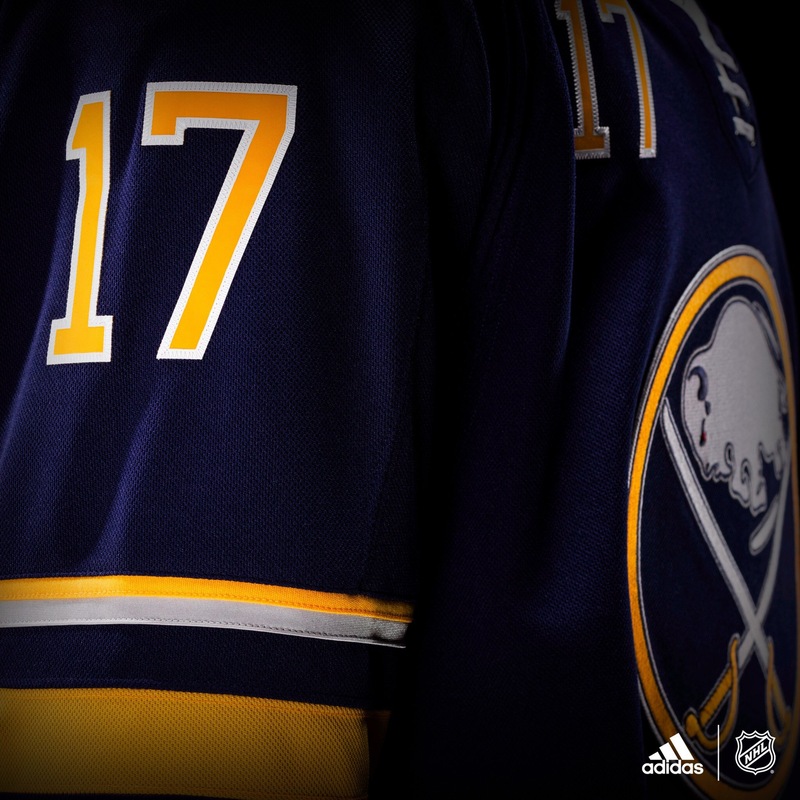 The Sabres revealed much needed changes to their jersey on Thursday, though they didn’t exactly change everything to the fans demands. The fanbase’s cry for royal blue went unanswered as had been expected once Adidas began releasing teasers for the new set. We took to twitter to see what your thoughts were on the new threads. Ok #Sabres fans, now's the chance for you to be quoted in an article. 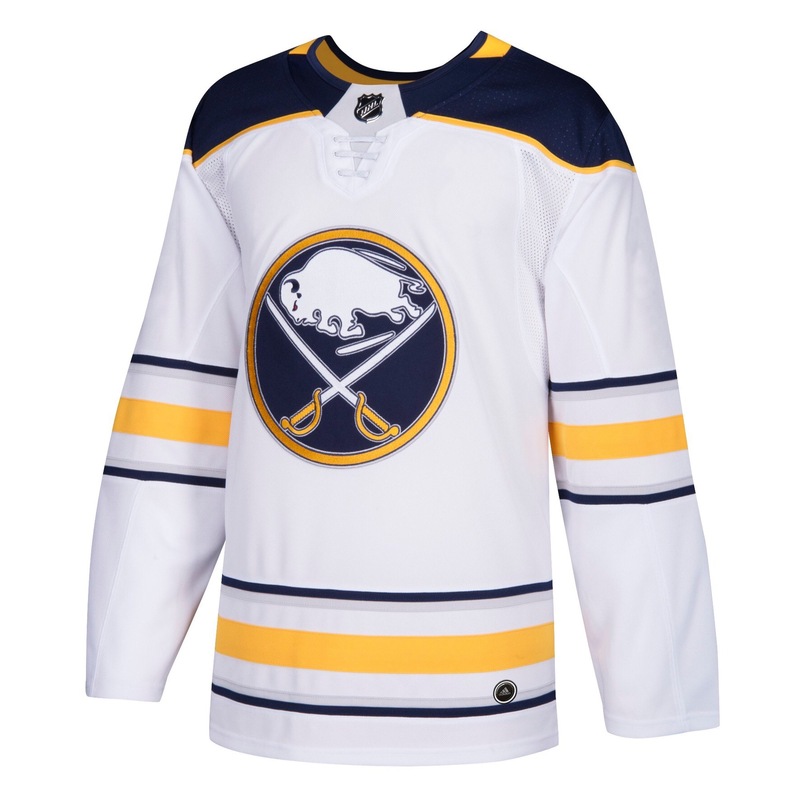 What do you think of the updated Sabres uniforms? Of course, just because they’re not royal blue doesn’t mean they’re a complete failure. I actually think the changes made are massive improvements. So let’s begins with the front. The logo remains unchanged. It seems like the grey may have been tweaked a bit as it looks white in the picture above. In reality the grey will show up under the lights at Key Bank Center. At least it’s a promising tease of what could have been. The collar also underwent some changes. Seen in the picture above is a redesigned tie down collar. 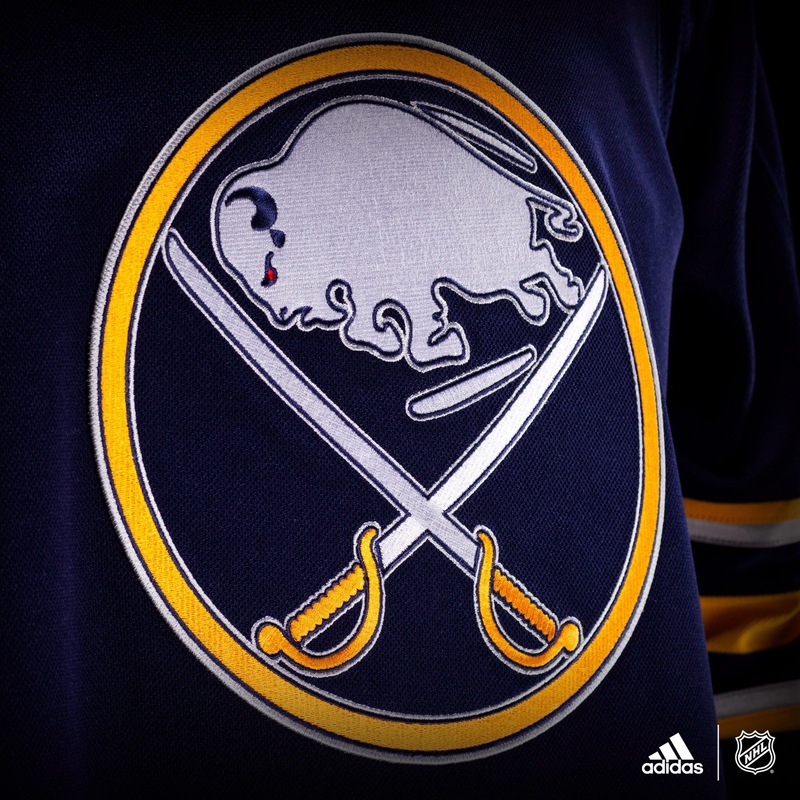 The Sabres went with a “messy” lace-collar if you will since introducing the home design in 2009. The team is now adopting the style made famous by Minnesota, featuring 3 horizontal laces. This is perhaps the most revealing image we’ve seen of the jersey. At last, no more piping and pit stains! The artifacts of Reebok’s time as uniform manufacturer have finally been discarded and create a much cleaner and updated look. The grey lines will do for now, but we won’t be complaining about much when Jack and the boys are throwing their arms up after goals without showing fabricated sweat stains. 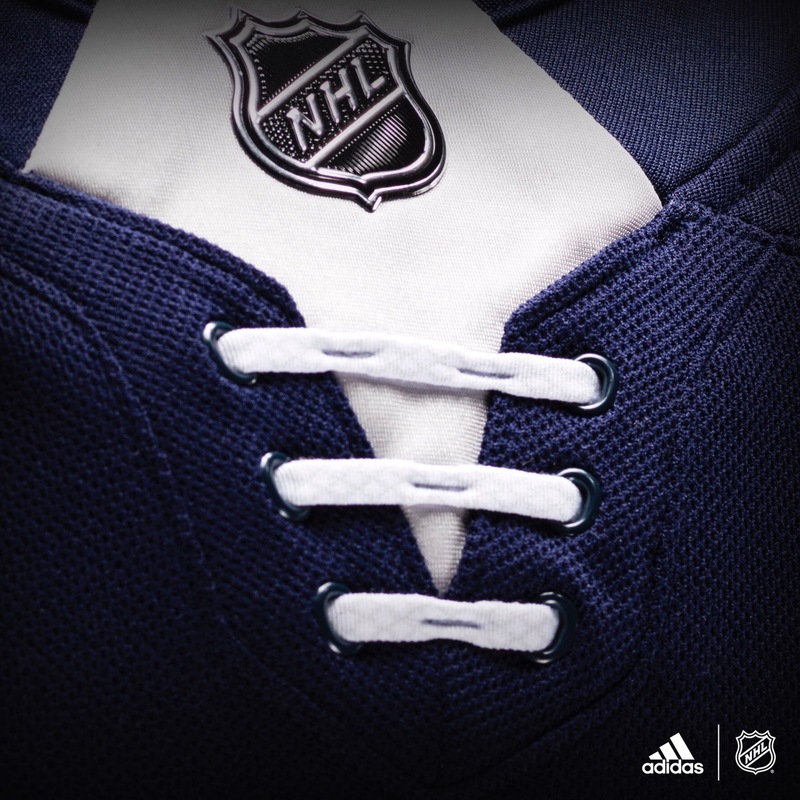 This is where we get our best view of the collar on either jersey. There was definitely a missed opportunity with not bringing the yellow to the front half of the collar as well. The yoke area can use a little more life with the thinning of the yellow outline around the blue. The thin grey stripes along the blue is my biggest gripe here. The grey blends into the white which creates a lot of empty space between the blue and gold both on the hem and sleeves. Our followers on twitter had more to say about the uniform. Some negative, some positive. The tweaks are fine, that the consensus fan preference for a switch to Royal Blue has gone unheard is disappointing, if not unsurprising. I'm glad they lost the silver pits. Wish they went back to royal blue, but based on sticking with navy, I think it's a decent improvement. Thanks for reading! Remember to follow SabresFanatics on Twitter and Instagram for your chance to be featured in an article like this. Send us your feedback and keep checking back for more top notch Sabres analysis.